I can’t decide if their fraternal or identical because all the papers in these two cards are identical they are just flipped over to show the other side. 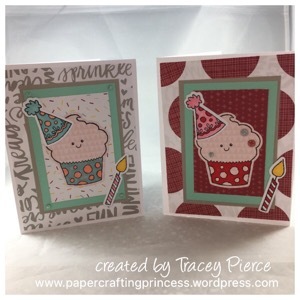 I love everything about these cards especially since that cute cupcake has matching thin cuts. 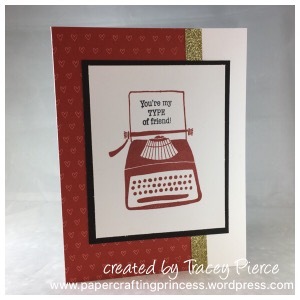 Did you know that if you’re looking for inspiration my posts are searchable either by the category of card, paper packet or stamp set? I love it when I can be a part of your creative life. 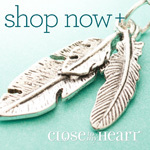 If you’re looking for a Close to My Heart consultant, I’d love to be yours. Thanks for stopping by I hope you’ve got a little Sugar Rush now. 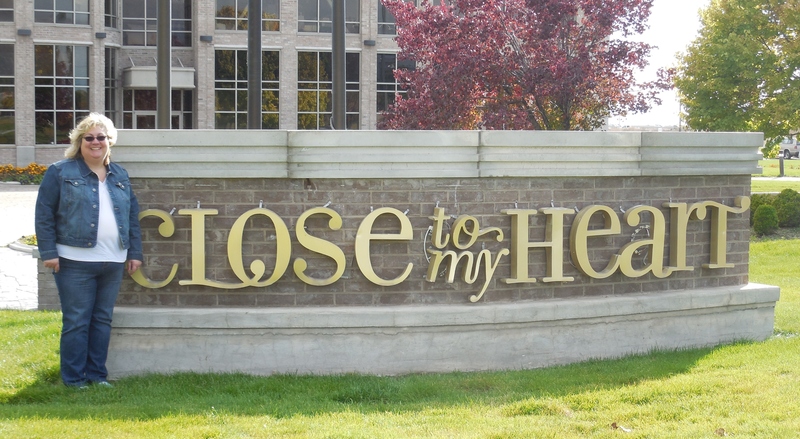 This week the theme at the Heart to Heart Challenge blog is Tea Time. Although the March Close to My Heart Stamp of the month was a fun tea-cup themed stamp set, I decided I wanted to do something a little different. I grabbed some left over papers from my Sugar Rush paper packet layered them up and stamped one of the sentiments from the SOTM in the bottom corner. 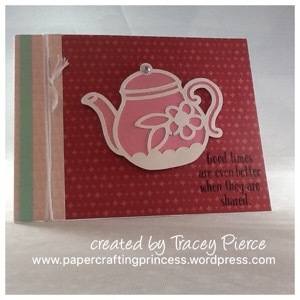 I then cut the cute tea pot and overlay from the Flower Market Cricut cartridge. You can’t see real well in my photo, but I used the clear shimmer brush on the tea pot and added a clear sparkle gem to the lid. So easy and fun! There was a bit of a question if I would get home in time to get my card and post done, but when this girl is on a mission she usually accomplishes it. 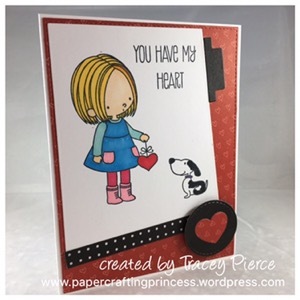 I had fun playing along with each of the weekly challenges at Heart 2 Heart this month. I hope you’ve enjoyed my posts. I challenge you to stop by one of the many challenge blogs (preferably the Color Dare since I’m a Design Team member) and get some inspiration. This month the Stamp of the Month features 6 great teacup and coordinating images along with 5 sentiments which you can order for just $5US with a qualifying purchase. That sounds Tea-riffic to me! I decided to take some inspiration from the photo in the Seasonal Expressions and instead of a scrapbook I changed it to a 3.5 X 8 card. I softly water colored my teacup to not smudge the pomegranate ink. 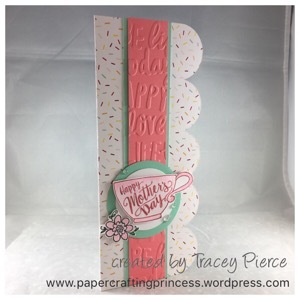 The sugar rush papers gave a fun texture to the base of the card. I added a small piece of Sea Glass glitter paper on the inside edge to show under the scallops. Remember the stamp of the month is only available during the month of March so order yours today by visiting my webpage http://www.papercraftingprincess.ctmh.com. I’d appreciate it if you took a moment and let me know what types of cards you like to make by leaving me a comment.